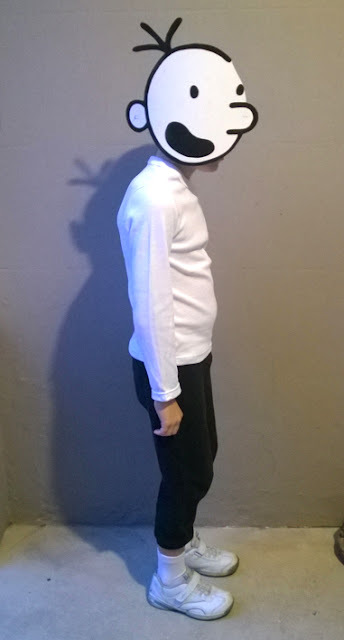 This year our son, who is in Grade 3, chose to dress up as "Greg Heffley" to celebrate World Book Day at school. 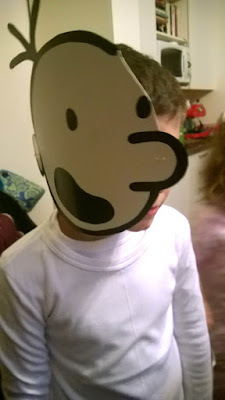 Gregory "Greg" Heffley is the hero/antihero protagonist of the realistic fiction book series Diary of a Wimpy Kid created by American cartoonist Jeff Kinney. It was an easy and fairly quick dress up costume to put together. He wore a white vest, his old (now too small for him) black tracksuit trousers, white socks, white trainers and a mask. I made the mask using a sturdy piece of white card. I copied the face from one of the illustrations in the book. I drew it in pencil first and then coloured it in using a black permanent marker. I had some transparent elastic (that I usually use for making beaded necklaces) that I threaded through small holes I'd made using a needle, and tied it to hold the mask in place. It was his idea to make a "side fitting" mask which turned out to be very effective and much more practical than a front fitting mask would have been. A front fitting mask would have required eye holes and may have spoiled the face a bit. He looked super cute, don't you think?